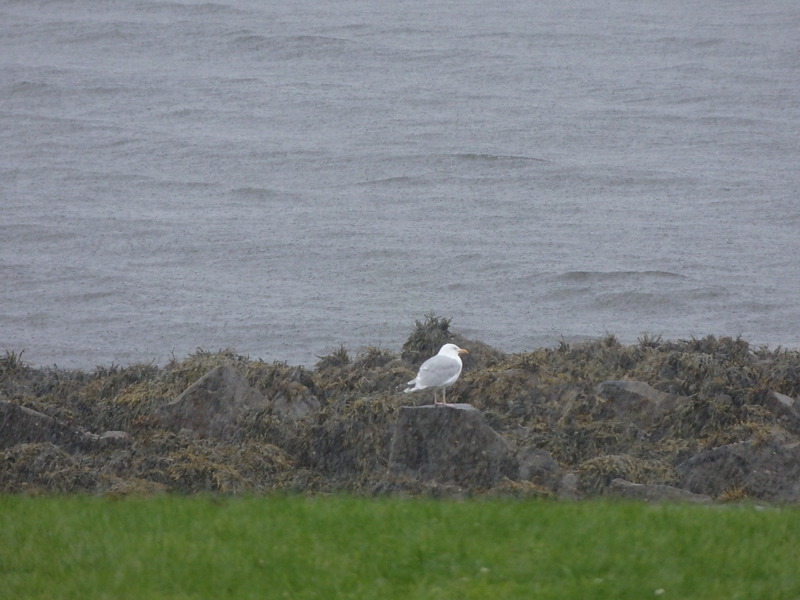 There was a day last week – Wednesday – when the rain came down with such a weight that a seagull stood by the rocks looked beaten and bowed down by it. It came in billowing drifts up the bay clouding everything so all we could see was a veil of grey thickening the air. Every so often it would clear and we thought it would be dry for the day but then we saw another cloud breaking over the tip of Rosskerrig and the rain came down again heavier than ever. The apron of concrete at the head of the pier was slick with the water that flowed back from a blocked drain and all the green in the garden and such that we could see in the surroundings hills seemed to thicken again. Eventually, sometime after midday, the billows of wet stayed away and the air started to dry itself out. This was just as well as a BBQ had been planned for the evening. The bad weather made it easier to spend time in the kitchen preparing. Red peppers were scorched black under a hot grill, skinned and then put through a liquidiser with olive oil, red wine vinegar and whatever herbs and spices I could find in the cupboard that seemed appropriate for chicken piri piri. The dark red sauce was smeared over the chicken pieces and they went into a fridge to take on the flavour for a few hours. Lentils were cooked for an hour or so in boiling water flavoured with half a dozen crushed cloves of garlic, drained and mixed with more olive oil and red wine vinegar and topped with semi sun-dried tomatoes and feta cheese. More tomatoes, radishes, cucumber, peppers, rocket, mint and parsley were chopped and mixed together with crushed garlic to make a chopped vegetable salad. Finally a bag of Kilcrohane potatoes was peeled and boiled. A careful eye was kept on them so they were drained whilst they still had some bite and before they turned to mush in the pan. Once they had cooled they were dressed with some red wine vinegar, diced and mixed with a mayonnaise flavoured with finely diced gherkins, capers and garlic, tarragon and parsley for a potato salad. All the food was being made for various workers from The Good Things Café that Kristen had invited round. There was real pleasure to be had in preparing food for people that had helped feed me so well in there over the course of the last ten years or so. Once the food was substantially prepared the sun started to break itself out against the grey weight of the sky. The storms of the previous few days had pushed water and seaweed high up onto the beach and washed away the fire that we had used the previous week. So time was spent clearing back the seaweed and rebuilding the fire. There was then time for a walk round the block up into the hills behind the Cottage from where we could look down over the long stretch of the bay. It was then time to light the BBQ and cook the food. The greatest compliment came when someone mentioned how much she liked the potato salad and the speed with which the food was consumed.